Looking at those small beautiful hands and feet of her baby is a mother’s most prized memory. Be it holding hands with your mate just after taking the vows or celebrating any big event in your life, it is these memories that make a life fulfilling and Bhavna Jasra is here to immortalize them for you and that too in gold. In city to charm with her work was her associate Gunjan Adya who got many from the city hooked to Bhavna’s art. It is the 3-D way many celebrities from the film industry and the business world have had Bhavna dip the hand or feet of their babies or the couple holding hands in clay to make a cast to get a 3-D impression. The impression is then made in gold and framed to make the most special memory come alive again and again. “It all started when I went to London to take a break from my busy marketing consultancy career as I was pregnant,” says Bhavna. “There this 3-D impressions done by a lady caught hold of all my passion and I waited like crazy for days sitting in her office to see her but she did not have the time,” says Bhavna. “I thought if in city like London jahan rishton ke zyada mayne nahin hain hain and she was so busy and how busy I would be in India!” “In India we have a chain of events and celebration of bonds of love be it birthdays wedding anniversaries or reverence for your spiritual Guru, just so many reasons to celebrate that the list is endless,” says Bhavna. Makes sense and busy she has been. Ten days after her baby was born she did her impressions and seeing her model Aditi Gowatrikar’s husband who is a doctor in the same hospital requested her to do the same for his baby and since then there has been no looking back. “The impressions are a thousand per cent personalised and through the ups and downs in life they are the reaffirmation of the vows you have taken in life,” says Bhavna. “When likes of Celina Wadia say wherever in the world she makes her home these impressions will go with her, I am touched,” says Bhavna. This is what Sachin Tendulkar’s wife gifted her husband on behalf of her kids, Anil Kapoor got this from his wife recently and the exhibition of her work in Sector 8 by Gunjan Adya got orders from Chandigharians already. Bhavna will be here to take the impressions this Sunday. For a price starting at Rs 25 thousand for gold or silver impressions no one is complaining. While you can frame the gold impressions in beautiful silk backdrop with embroidery and club it with a photo and most popular is her impression along with the caricature of the person done by famous cartoonist,” says Bhavna. “Twenty five per cent of my work is impressions of Gurus, people revere and like to keep in their homes,” says Bhavna. All for emotions immortaslised in gold! Think piranhas and images that come to mind is of a horse, unfortunate enough to venture into the dark mysterious water of the Amazon river being devoured by a group of these little devils in two minutes flat. The image, of course has its roots in one of those Hollywood films in which a few romantic couples cruising on the river get into a sticky situation because of the piranhas. So when one gets an opportunity to see live piranhas in Chandigarh itself, the temptation is too strong to resist. “Do not put your fingers even for a second in the aquarium. 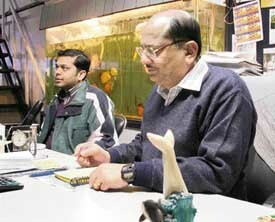 One of my men nearly lost his finger when he tried to catch one when they arrived” says Lalit Azad, the owner of Azad Aquariums ‘n’ Fortune Fish. That was enough to put us in restraint even after we got assurance from Azad and his son Akhil Azad that many of those carnivours have been tamed and now converted into ‘Tetramin’ eaters. Not that we doubt Azad Sr’s credibility, who has proved himself to be an authority on both fresh water fishes and marine creatures. A self-professed nature lover, Azad’s romance with fish started with his visit to Mumbai’s Tarapur Aquarium about 40 years back. He was a student of class VIII. The sight of fishes excited him so much that he promised himself to have his own aquarium someday, which he did in 1971— a huge 12 feet by 9 feet one, made of steel and battery compounds. It still finds a proud place in his aquarium shop in the Industrial area. The fact is that Azad never got over this romance with these aquatic creatures. He travelled to numerous countries and brought back techniques from those countries. Not only that, his now has condensed his four decades of knowledge in the form of a book called Enjoy Your Aquariums and Fish. Even if you do not have an aquarium to take care of, the book with bright, colourful pictures makes an interesting reading, giving an insight into right from the creation of an aquarium to the maintenance of it. Though during the talk session Azad proves himself to be a man of few words, he more than makes it up in his book, elaborating each chapter with details, but at the same time with the precision of a scientist. By the time one completes the book, one is confident enough to start our own aquarium, but to have a head start we ask for a piece of advice from the author himself – what is the latest trend in aquarium culture? “Marine fishes,” says Azad. “It’s the latest trend which have caught the fancy of city aquarium lovers,” he says. Well, according to the expert who has now focussed his entire energy towards marine aquariums, they are easier to maintain though it is a little expensive if one compares to the fresh water aquariums. Well, if you can overlook the cost factor, having a slice of the sea with those colourful starfishes, anemones, moon and exotic wrasse in your living room is not a bad idea indeed! School days, they say are the best days. As many 45 odd girls from Sacred Heart School and College in Dalhousie tried to revive their golden days by organising a re-union party. It was a day to recall those wonderful days spent in the picturesque hills of Dalhousie when the girls in their teens would quietly sneak out of their beds after the lights went out to play pranks on each other and for midnight feasts. Nostalgia beckoned the girls, starting with the 1958 to 1985 batch, when they all came face-to-face after a long gap at the CGA Range. The fun part was not just confined to the movie only, but also the hot paranthas at a nearby Amritsari dhaba and kabab corner. So what about chasing boys and having boyfriends? “No boys chasing happened, as there were no other schools around at that time,” they rue. With the girls wearing their attitudes up on their sleeves, ‘we are the students of Sacred Heart and we are class apart’, who would need boys anyways? So while we were busy taking notes, Kiranpreet Kaur, who organised the event along with Ramneek Kaur, better known as ‘Betty’ among friends, repeatedly calls for ‘Makhan’. No no, the call was certainly not for butter but for Nirmaljit Kaur, who Kiran later introduced as the ‘life of the class’. “Breaking rules was just a part of having fun, but the girls always behaved and remained in their limits when it came to discipline,” says Kanwal Sekhon. “Each time we would plan to have a midnight party, the idea would just crackle out before it materialises,” she muses. Hope it revives your memory of good ol’ school days! On my most recent absence from Chandigarh, I missed quite a few things about the city – despite the fact that I was back to my city of youth – Kolkata – where I grew up eating an unfailing diet of fish and rice and waiting for unending political processions to clear the streets. Sitting amidst an ocean of traffic and inhaling vehicular emission in the purest form – I found the traffic uncannily still and quiet. Nobody bothered to honk just because we were not moving and nobody tried to wiggle in and out just because there were a few inches left here and there. No rickshawalla flung himself in our way and no cyclewalla dared to sandwich himself between the double decker buses. I went to a lot of the new malls – very fancy and western, with brand name stores and multiplexes and felt quite lost and missed Sector 17, the music at the fountain and the cool outside air heavy with the smell of fresh popcorn. I also kept telling everyone amazing Chandigarh facts, such as – I can get to my office in seven minutes flat, we can get to the station in fifteen minutes, we still have andawallas and breadwallas that come home, we have kudawallas that actually pick up garbage from our doorstep (as opposed to the beeping municipal truck that makes the rounds in Kolkata), and last but not the least, we can go to many of the government offices and actually speak to a real person about our real problems. Some of the relatives shrugged and made a disbelieving face, some sighed in utter sadness. I of course, missed the lake. When I told my friends that we get to jog while listening to Hari Prasad Chaurasia, some of them passed some rather intriguing comments. When I compared the air quality, they called me paranoid. When I blamed the traffic for reaching late and apologised saying that my estimates have become rusty after living in Chandigarh, they gave me scornful looks. When I praised the grocery stores and said we get good baked goods in Chandigarh – they unequivocally denounced my claim – for Chandigarh does not have a Flury’s. I grudgingly acceded. On my way to the airport, I looked at the passing images as nostalgia flooded my mind and wrung my heart. As I sat in the airport, waiting for the flight, I thought of Chandigarh and the joyfulness of living here. I thought of the winter Chrysanthemums, the Rose Garden, the blooming Jacaranda trees, the meandering rides to Kasauli, the hot dhaba daals, the evening flocks of parrots and the peace and quiet that descend upon the city after darkness falls rapidly in winter evenings. I perked up as they announced my flight – it was nice coming back home. The growing up years that I had spent in Welham Girls High School, Dehradun, took me to the dinner evening that was organised by the Doon School old boys fraternity. It was a combined bash for the old Dosco boys, the Welham girls and the Mayo College Ajmer old boys. Whereas only two of the Mayo guys showed up the evening was rather alive with the Dosco’s their wives the Welham girls some with their spouses swinging to the tunes of old film songs by the live band at Moti Mahal, Sector 17. No matter that there was the younger lot, initially cribbing over the music, but by the end of the evening just about everyone was on the floor dancing to it. Since this was the Ist bash of its kind that I attended in Chandigarh, I thought it was a lot of fun. Catching up with people one hadn’t seen in years, recalling names and faces was sure enough to let you drift down the memory lane. What one was singularly touched with was that the sense of camaraderie between the Dosco guys, although they were all different generations of people, suddenly age barriers seem to have been lifted and everyone was having just simple fun together. Took one back to the time of the socials in school. School dos always have a habit of generating this spirit. Everybody just tunes on to one’s own light-hearted side, lets their hair down and decides to chill. Talking to Dan Dhanoa, the racy villian of Bollywood and the sensitive artist back home, who was one of the organisers of the party he said - “Well we keep having these kind of evenings all the time, gives us old batch mates and their families a chance to catch up with each other, relive school and have some fun”. There was a rather good turnout of the Dosco’s and Welhamites although the party had been planned just a night earlier. Jayant and Samit two young Dosco’s had actually driven down specially from Yamuna Nagar for the bash. I enjoyed meeting with the Welhamites who were around, much younger but with the same spirit, which we had and the same sense of fierce loyalty towards school. Talking to Hema Bedi, “Sweet of the Dosco’s to have invited us. Really nice party and I even found an old friend after years. Looking forward to more of these evening”. Niyam Sidhu who heads the Chandigarh chapter of Welhams said she enjoyed the evening thoroughly, “It was good to renew old contacts and meet a whole set of new people” since her husband is a Sanawarian. But the Dosco’s feel it is not all about fun and games. There are some very serious issues we like to deal with as far as the school is concerned, said Gurpreet Singh Bakshi, who heads the Chandigarh Chapter. “Fun and games is great but the fraternity tries to help each other in the best way possible”. They even try to find job placements for the younger guys passing out of school, and try getting admissions easier for sons of the old Dosco’s. In fact he is now in Delhi raising a voice in front of the committee for that. Ravi Bir Singh Grewal who has just retired from the All India Executive Committee was all praise for his school too. He talked about the Golf Tournament they organise in Chandigarh and one in Patiala also. Shubhinder Brar, a 1973 batch Dosco remembered the good old days when the girls were really not a priority in High School and the School socials just meant “Hey when do we get to attack the food”. Not very good for the ego hey Welhamites. All said and done “it was a great evening” in the words of Meera Singh wife of Ranjeet Singh who is an old Dosco. Lets hope they keep the spirit up and help people join in the infectious seriousness and fun spirit of the school. Nostalgia is really not good enough it is only the present moment that matters and school do’s have a way of connecting people of all ages in away that is a timeless feel. We all loved it. Now that says something for school power. Chandigarh was the city of the realisation of the dream of Kritika of facing the camera. After struggling for more than 10 years, this young girl with beautiful doe-shaped eyes was picked up by world-famous Ants director Suneil Babbar to essay the role of a teacher in his new venture, The Party. 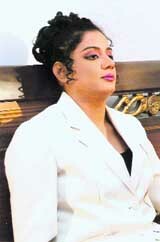 Kritika plays a glamorous and modern mam and her character is pivotal to the story of the film. For her, the experience in City Beautiful besides being novel, imparted a sense of flow of her artistic juices. “It is a pleasant break from my desk job at a Maruti dealership,” she beams, transformed into a gorgeous lady in a western outfit designed by budding dress designer Aditi Rana. Incidentally, this is also Mohali-based Aditi’s first foray into the exciting field of films and fabric. And where does Kritika’s confidence come from? “Though The Party is my first movie, I have worked in theatre. Acting is a passion with me and it comes naturally to me. I am a totally director’s actress. Suneil Sir is a perfectionist and explains all shots in detail,” she informs us in an informal chat. The trophies lining her home are proof of her acting abilities. Kritika has had the opportunity to play characters from the works of such legends as Sadat Hasan Manto and Munshi Prem Chand. In Manto’s Hattak, she did justice to the character of a prostitiute to such perfection that it fetched her the best actress award. The other award came her way for Anil Verve’s Thank You Mr Glad. It was directed by Vijay Sahni. The other role that Kritika remembers with pride is that a woman in labour that she portrayed in Munshi Prem Chand’s Kafan. Before her tryst with celluloid, the dusky Kritika also has lent her face to a music video and she starred in a couple of Doordarshan serials. While I was in Melbourne, Australia, I was a regular listener of 3MDR – a community radio station, where along with it’s innovative programming they would also give regular updates about the prevalent problem of ‘bushfires’ during the summers. This was my first initiation to community radio and I have been fascinated by it ever since. After the recent proliferation of private FM channels in India, the next big thing is going to be the much awaited community radio. Basically, community radio is defined as radio, which is owned by the community and airs programmes designed and produced by it, specifically for its own developmental needs. In 2003, the Ministry of Information and Broadcasting decided to grant non-profit, non-commercial radio stations to educational institutions at the school and college levels. Although the Ministry refers to this as ‘community radio’, it is, in fact, what fits the definition of ‘campus radio’. It is a significant departure from the primarily centralised-radio-broadcasting paradigm that our country has been following for decades. While there are ample illustrations from various countries of the ways, in which it can benefit a community, community radio in India is still a new phenomenon. The government expects a number of benefits to flow from the successful operation of community radio stations across the country. Some of these expectations include enhancing participation of people in the development process, capacity-building, especially in rural areas through education, providing opportunities to people to upgrade their skills and enhance their creative talents, preserving and promoting traditional wisdom, knowledge and skills, thereby helping to promote and project the local languages, arts, crafts, culture and traditions. It also envisages bringing topical information within easy reach of the rural population, in the areas of agriculture, social welfare, education, health and environment besides, creating rural networks for cottage and village industries. And as far as campus radio is concerned, the aim is to bring out and channelise the creative energies of the students, besides making them job-ready, to cater to the burgeoning demand of trained radio professionals in India. Anna FM of Anna University became the first campus based community radio in the country. It aired from the smallest, completely digital, tape-less, and multi-purpose studio from the university campus on 90.4 FM, broadcasting to a big part of Chennai, in a range of approximately 15 kms. And it was a booming success. Abroad, community radio stations are often staffed by volunteers and air a wide variety of programming. They are generally smaller than public radio outlets. They are distinct from public radio in that most of their programming is locally produced by local RJs and producers, while public radio tends to rely on more syndicated programming. Today we are about to witness the community radio boom and it is going to come sooner than expected. Better keep your ‘ears’ tuned-in. Shilpa Shetty set foot on sets of famous reality celeb show Big Brother but little could the bollywood star realise that soon she would be making news for all the wrong reasons. First the flood of solidarity from the audience for the racist tone of attack she faced on the show to her eating her own words on the show made news. This luteri of U.P. and Bihar, surely didn’t anticipate the commotion stirred all over. We take a round of the city and ask our city youngsters about their stance concerning the issue. Word of advice for the crying beauty (on the show) is to be firm and fight hard. “It was her decision to participate in a reality show. So, I think she should face the consequences as well. She should not leave the show; rather she should stay there and win it. Moreover the government there is on her side,” says Priyanka, a B.A. III, student. “In my opinion she should quit. Money is not as important as her dignity. She is representing the Asian community and her behaviour affects us all,” says Swati, a G.C.G student. “This matter should be taken seriously,” says Abhijeet. Well, the governments of both the countries are looking into the matter, but the freedom from the shackles of colour classification seems a long way. Vishram Sawant’s second directorial venture Risk is a fast-paced action thriller and commercial film. The story revolves around an honest police officer less cliché in portrayal. He knows there is no point in trying to change the system. As far as the genre goes Risk may be compared with other cop films like Ardh Satya, Shool, Ab Tak Chhapan and Shiva. It is a gripping tale of a cop at crossroad. The film opened on Friday at Neelam Chandigarh and Fun Republic Manimajra. With Risk Randeep Hooda once again proves his acting prowess. He is at his best again. Vinod Khanna’s comeback is excellent. His performance is terrific. Tanushree Dutta, Makrand Deshpande, Seema Biswas and Zakir Hussain are equally good. The outdoor locations of Bangkok, Dubai, Austria and Thailand are well picturised. Director Vishram Sawant shows a spark with Risk. Background score is average. A must see film for action lovers. Interworld Digital Ltd’s Mr Hot Mr Cool released on Friday at Nirman Chandigarh is disappointing. The film does not have much of story and the end is so predictable. As far the actors Zulfi Syed, Yash Pandit, Priya Valecha and Samiksha fails to deliver. A terrible let down by director Partho Ghosh. — D.P. I am a 24 years old girl sharing a room with another girl friend. We have been studying together for the last 6 years and have been good friends ever since we met on the Ist day of college. Now of course we have gotten into a habit of taking each other for granted. Life is good fun like this as we are both working and the evenings are taken care of as we can hang out together. Even otherwise our emotional support system is very good. The situation has become suddenly complex ever since my younger sister has come to live with us. My friend has become moody, she sulks and tries to find fault with my sister in every way possible. My sister in turn is beginning to get very upset and thinks I am not siding up with her on this score. I feel I am losing out on my relationship with both of them. What should I do? I am not happy with this situation at all. Friendship is a very complex emotional relationship. It also gives us a level of responsibility without our realising it and somehow when we are confronted with a situation we find it hard to deal with. Our friendships reflect the various stages of development of our own personalities although we love to believe that friendship is only about sharing interests, having similar backgrounds or similar views on life. These are important contributing factors of course but the trying test of a friendship always comes when one is confronted with a situation like yours. Here you are caught between 2 people you love deeply and do not want to hurt but are managing to do it anyway. Try to explain to your girl friend in not so many words that your sister is not a threat to your friendship with her in anyway. After all friends have their own equations which honestly are a cut above others. Here the bonding is out of choice and not compulsion. Your younger sister on the other hand is obviously jealous as she feels she is a sibling and has complete right over you. Gently explain to her that her position in life your life is always very special and in no way threatened by your girlfriend. All will work out smoothly when handed with calm good sense and judgement. My wife and I are creatures of a different mould. I studied in the U.S. for 10 years and came back to India to get married and settle down and have kids. I thought that by having an Indian wife I would be very lucky as my parents would be happy and also I would have children who would grow up with Indian cultural values and Indian habits etc. Though my wife fulfills all these qualities but then we seem to share nothing in common. Emotionally I have started living completely on the edge. I feel very lonely and dissatisfied with my life. My parents and kids are quite happy with her but I feel very discontent. The dilemna of most NRI’s has hit you. The cross between two cultural scenarios is a gap that can never be filled very easily. Environmental conditioning is a very important aspect of the human existence. But then you must also remember that the human mind is very malleable and can be turned in any direction if we train it to do so. We all have problems and dilemmas and from time to time need to deal with them. What we think is good for us at some point in our lives is a concept we outgrow after a while. Life is not that easy we need to constantly keep dealing with new problems everyday. In your case you have always managed to get what you want and yet you are not happy. Try and work on your relationship with your wife. Explain to her your emotional needs. She must be waiting for you to reach out to her. If she has managed to fit into the other avenues of your life, I am sure with a little effort from your part this too will get taken care of. I am a woman in my 60’s and have lived a full life. Now I have children and grand children. However despite this I have moments when I feel very lonely. I do try to keep busy in indulging myself in social activities. I have joint a social service group. I have a few friends with whom I meet every week to discuss and relate on emotional and spiritual issues, still I do not feel satisfied with my life. I wake up every morning thinking what is the purpose of my existence. I dare not voice this to my husband as he looks quite content with his life the way it is and seems to see no reason why I should be feeling the way I do. I feel I am searching for a level of happiness, which is way beyond the mundane and the ordinary. Sometimes I think I am confused and yet at other moments I am driven by this search for more meaning to life. You sound like a person who doesn’t feel a sense of self worth unless you find yourself gainfully employed in something that appeals to your level of happiness. I understand that you feel that with the change in our life expectancy, today’s world people are entering their 60’s almost as if they were given a new lease to life. A second chance to live their adulthood, this is absolutely great. It’s just that it takes a while to break out of your cultural conditioning of old age at 60. You like many others are facing un chartered waters at your phase in life. Do not feel confused, be completely free in your thinking, connect to your inner core and find that particular sphere that feels the most inspiring and intriguing to the way your mind works. Now that you are blessed with this new outlook to life, please do not be confused. Just have fun and enjoy it. The meaning will come anyway to you.